When you make an acquisition through the U.S. Gold Bureau, we can help arrange to have your precious metal coins and bars delivered to your account at the Texas Bullion Depository. The Texas Bullion Depository insures all depository account holder contents against loss through the Lloyd’s of London insurance market. Your trust is everything. That’s why the U.S. Gold Bureau will help you arrange for storage at the Texas Bullion Depository, the only state-administered precious metals depository in the world. The Texas Bullion Depository guarantees that your precious metals assets are safe. The facility uses multiple, overlapping layers of security to ensure proper chain of custody - from the time your metals are deposited to the time you withdraw them and they are shipped back to you. If you ever want to liquidate the assets held in your account at the Texas Bullion Depository, the U.S. Gold Bureau can assist in making a market for you to liquidate and receive cash for your precious metals. Why Secure Your Investments at the Texas Bullion Depository? The Texas Bullion Depository is a state agency of the State of Texas. As such, it is held to higher standards and oversight than other depositories around the country ran by private management. When you have an account at the Texas Bullion Depository you remain in control of your assets. The Texas Bullion Depository offers an online portal for you to access information about your precious metal assets and check the market value. 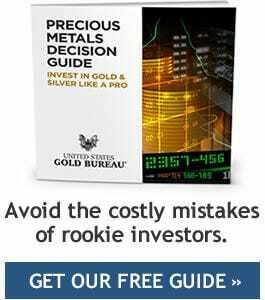 At any time you can request a withdrawal from your Texas Bullion Depository account and have your metals shipped back to you, or liquidate them for cash at the market price. The Texas Bullion Depository was created to provide a safe and secure location for Texans, U.S. Citizens, and others to have a safe, insured location to store their valuable precious metal assets. Unlike other depositories, the Texas Bullion Depository is a state agency of the Texas Comptroller of Public Accounts. The facility is overseen by Texas Comptroller of Public Accounts, while most other depository offerings are only managed by a private depository management team, with no oversight other than an occasional accounting audit. Visit the Texas Bullion Depository or phone TxBD directly at (844) 416-4653 to learn more. Our Account Executives can help you determine when metals storage at a depository should be considered for your investment portfolio. For more information about storage at the Texas Bullion Depository, call us at (800) 775-3504.